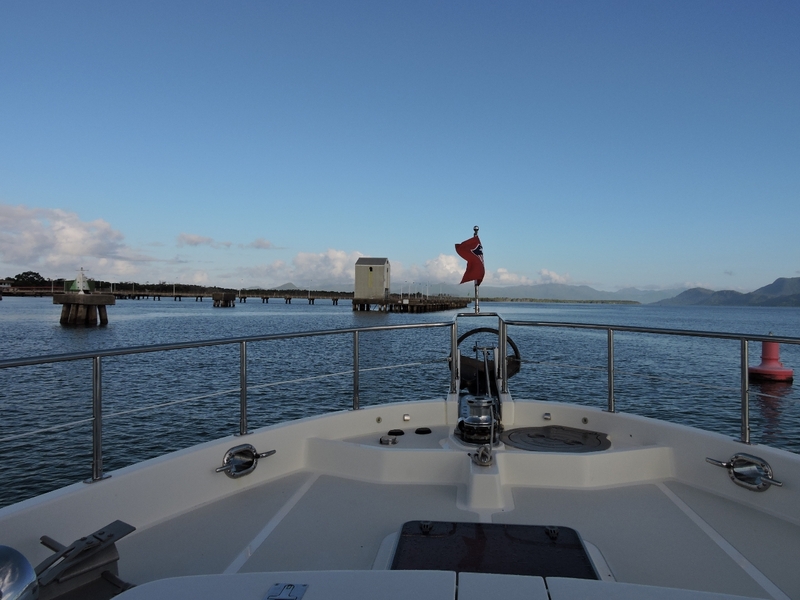 North of Townsville we stopped at Orpheus Island National Park and then passed though beautiful Hinchinbrook Channel. 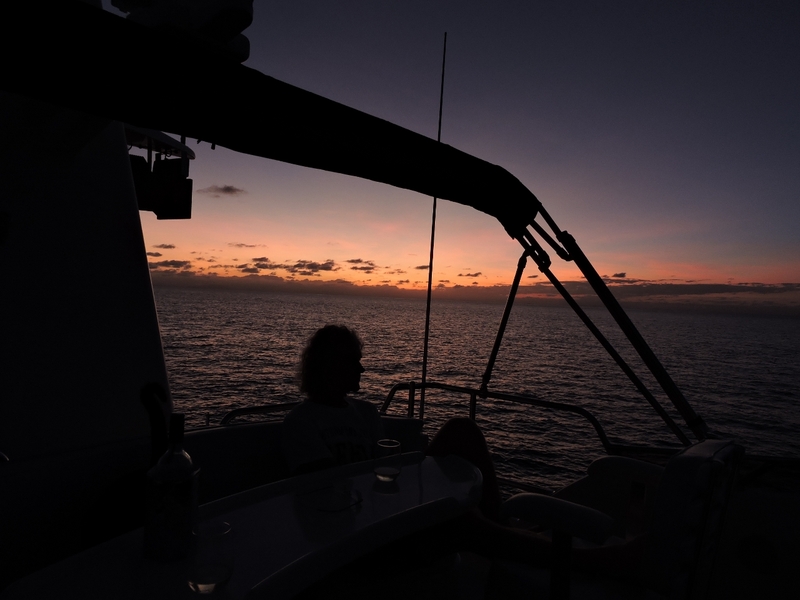 With winds forecast to blow less than 10 knots for the next few days, we then returned to the reefs–our first time since Circular Cay off the Whitsunday area last October. 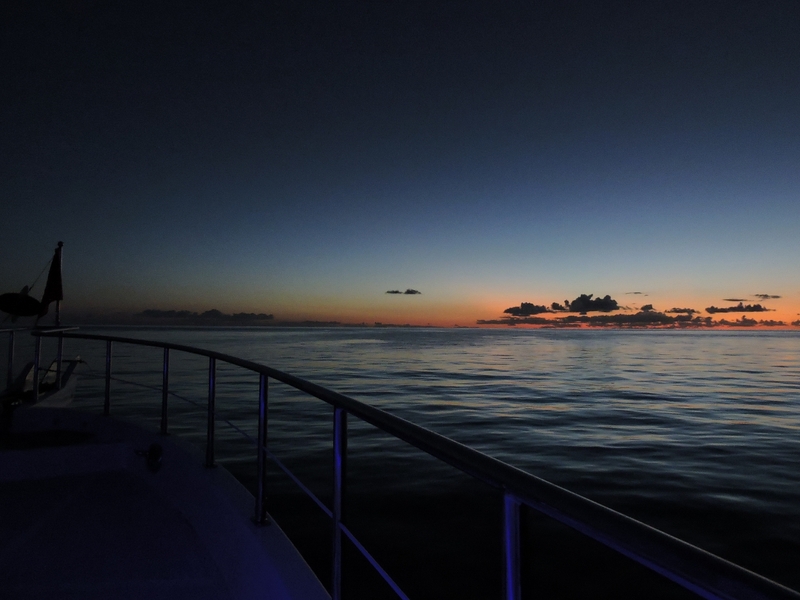 We had several excellent dives, particularly at Flynn Reef and near Michaelmas Cay. 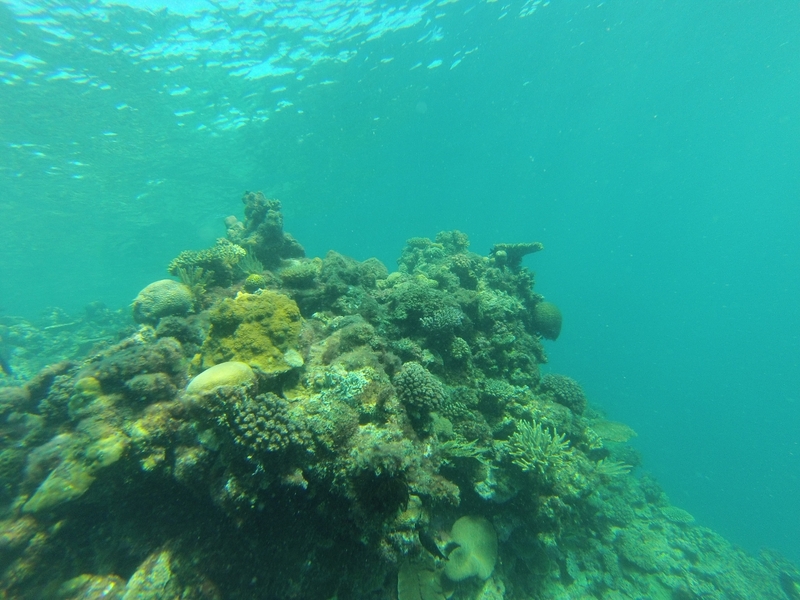 We really enjoy our time out on the reefs and it was great to be back. Most of the island is undeveloped National Park. We’d intended to land on Yanks Jetty and go ashore, but a vital piece was missing. It appears we’d arrived a little early for the new dock to be completed. So we landed on some large rocks and used the Anchor Buddy, effectively a bungee-cord attached to an anchor, to keep the tender in deeper water. 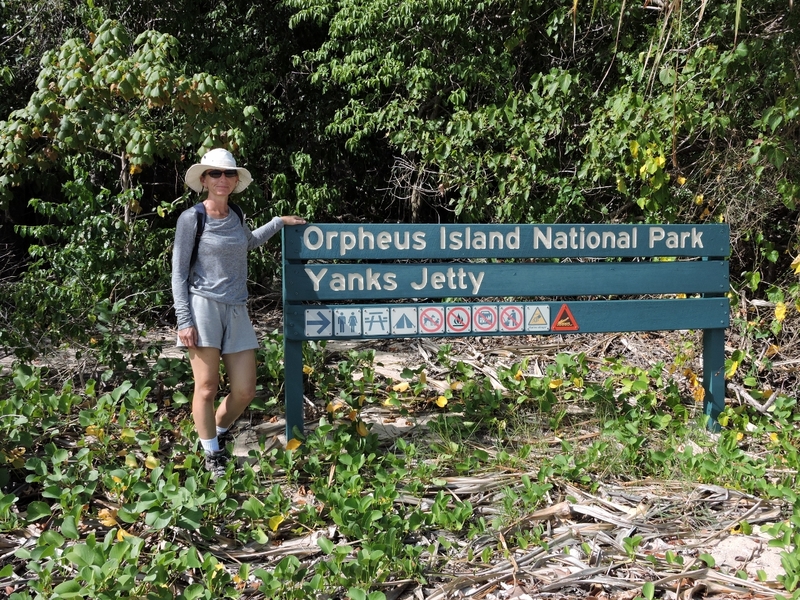 Our guidebook indicated that the island had good walking tracks, but we couldn’t find any information on-line, nor could we find anything around the campsite south of Yanks Jetty. So we satisfied ourselves with the view north into Hazard Bay from a rocky bluff south of the jetty. 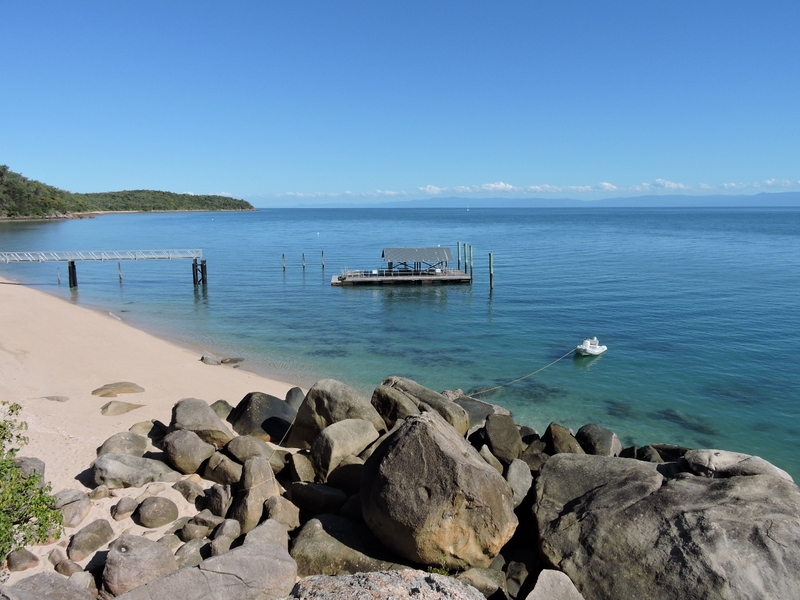 The luxury resort at Hazard Bay apparently doesn’t welcome boaters, so we followed the marked channel to their jetty to have a look but didn’t go ashore. Sundown drinks in the cockpit, looking east from the anchorage in Juno Bay. We left Juno Bay before light so that could arrive at Lucinda Bar at high tide. On a 9.2 ft high tide at Townsville, we saw a minimum depth of 12.5 ft crossing the bar. We followed the leading lines part of the way across, and then changed course to deeper waters. 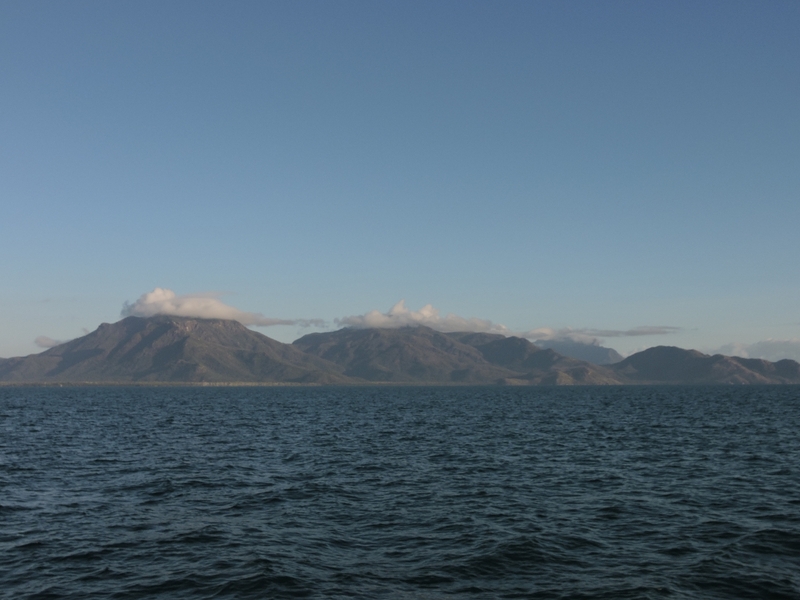 This is the view to mountainous Hinchinbrook Island as we approach the bar. The channel is rather narrow off the old molasses Jetty at Lucinda. 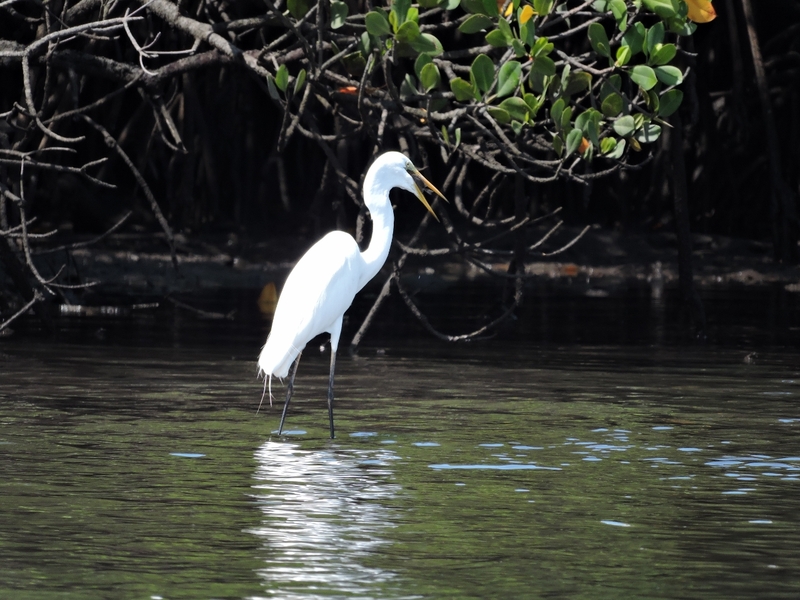 Heron working the shallows off the mangroves in a mainland channel. We’re in crocodile country now, and will be for the next few months. 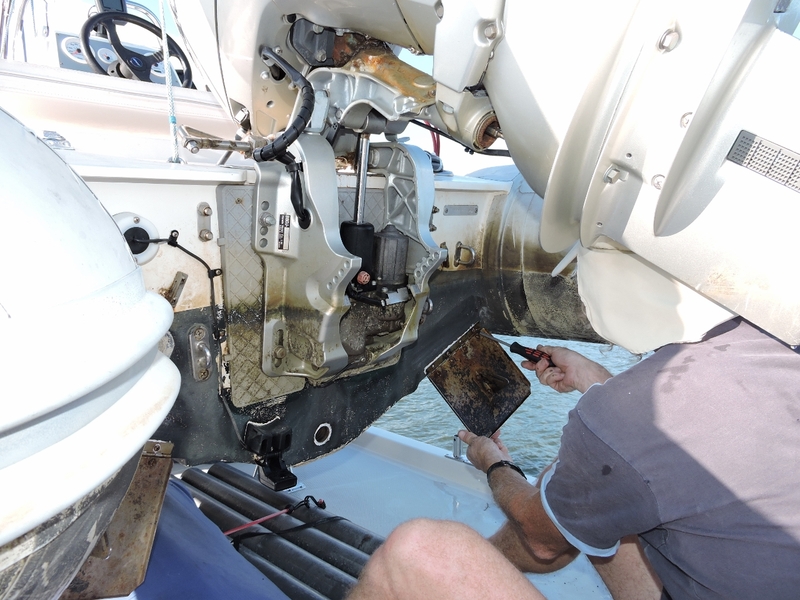 We replaced the dinghy trim tab struts and resealed the drain and the hull-to-trim tab mount point. The new trim tabs apparently have seen some design changes, so the new struts don’t match the old mounts. We adapted the mounting plates to achieve a fit. 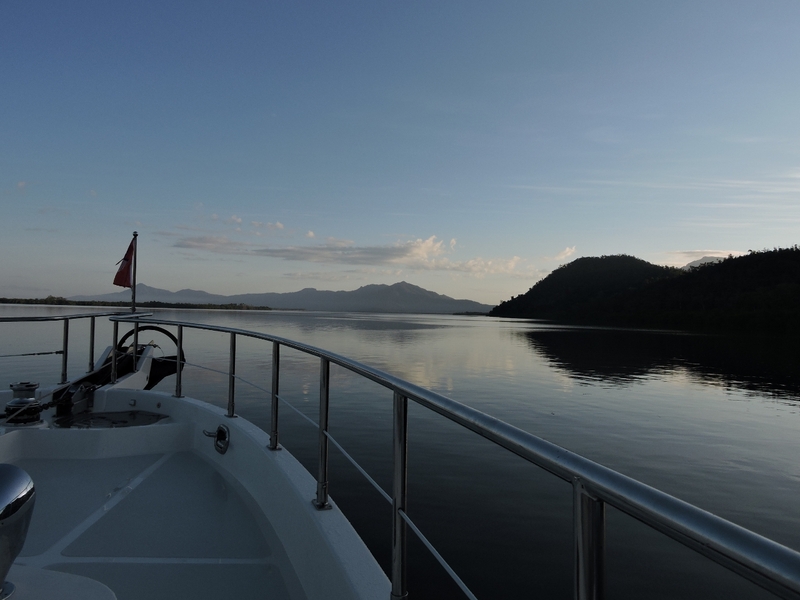 Hinchinbrook Channel is quite scenic, with mountains on both sides. We likely would have stayed another day, but with several days of calm weather forecast, we left early to head to the reefs. 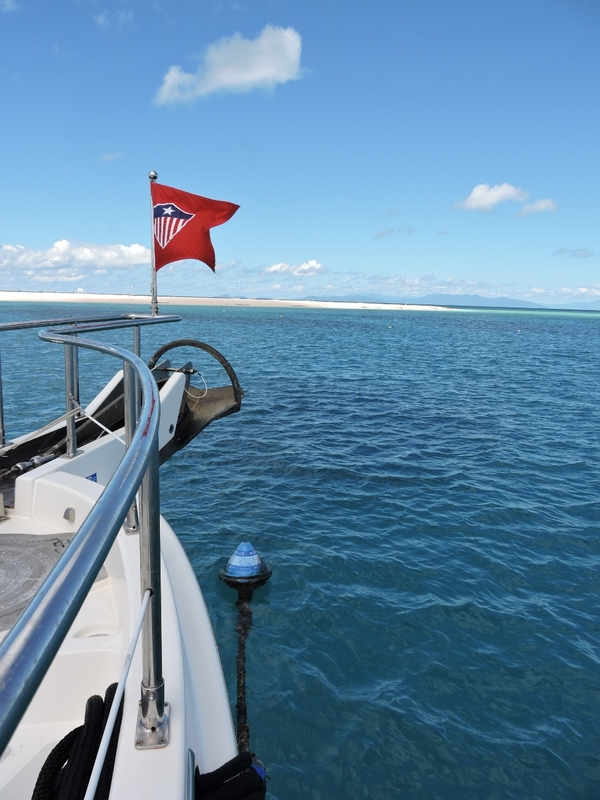 With winds forecast to blow less than 10 knots for the next few days, we’re back out on the reefs–our first time since Circular Cay off the Whitsunday area last October. The small sand island to our east is the only land visible for miles. 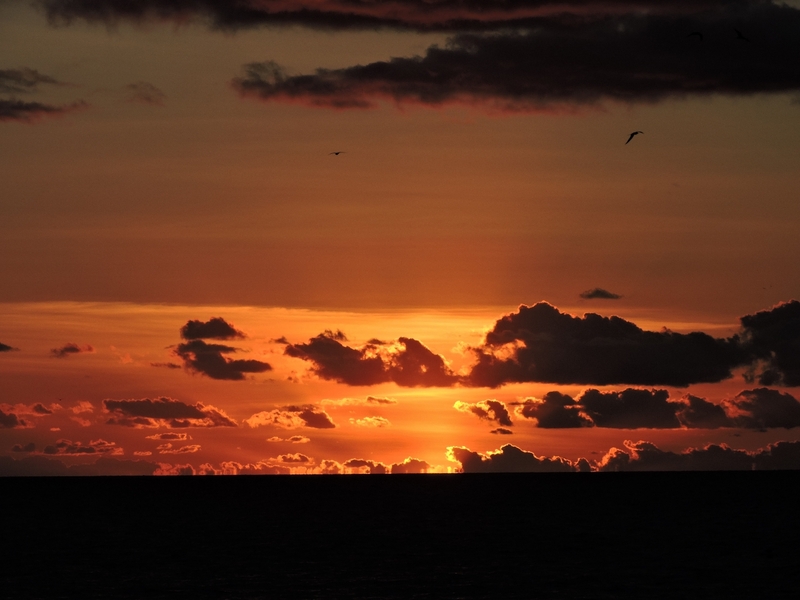 We love it out here–it’s great to be back. 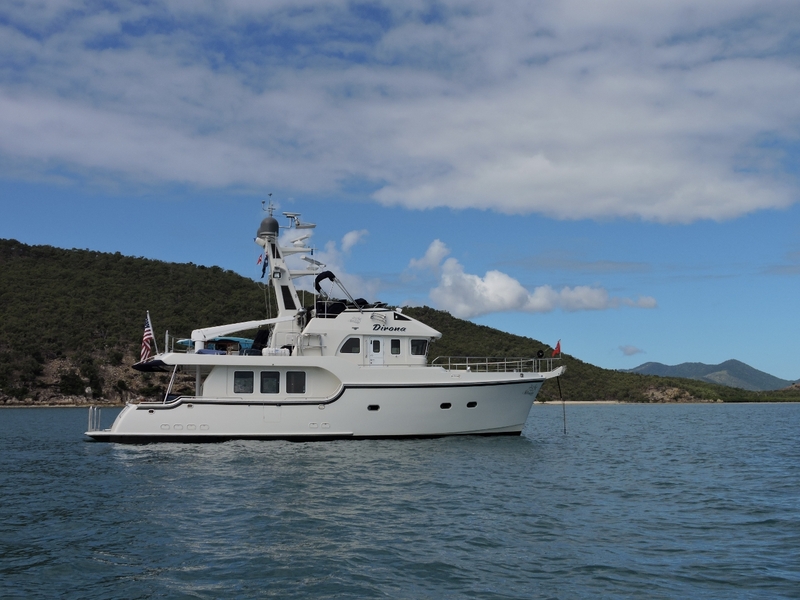 We anchored the tender by the stern with the Anchor Buddy and pulled a bow line ashore with a grapple. Lunch ashore on our own private island. The tide is reasonably low right now–at high tide the islet almost disappeared. 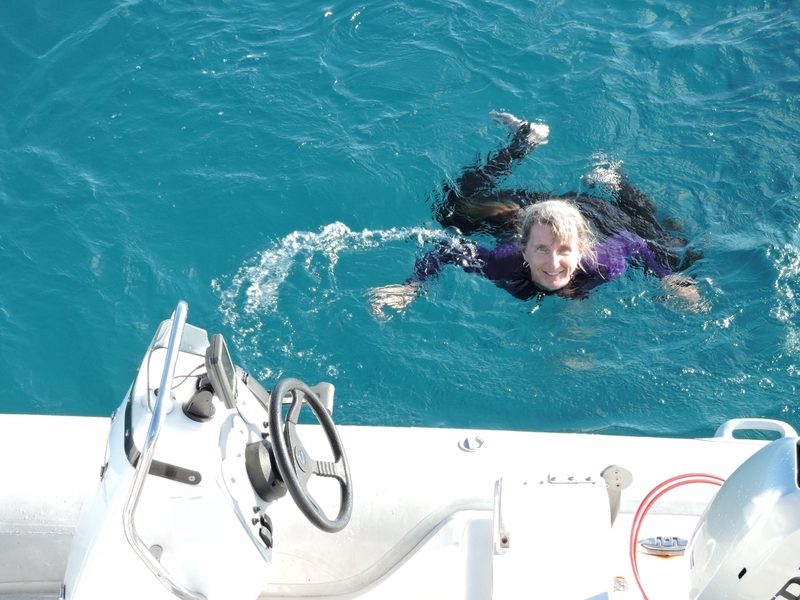 Jennifer having a swim off the stern of the boat, wearing a lycra skin for protection from marine stingers (jellyfish). The current was strong enough that she could hold position while swimming against it. 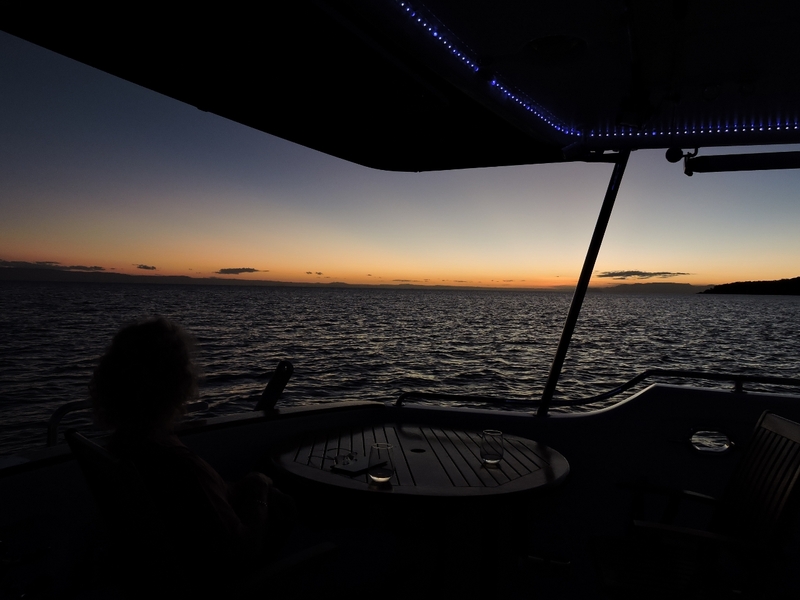 Enjoying the sunset and evening breeze from the flybridge. We hardly need the reef for protection in these calm seas. 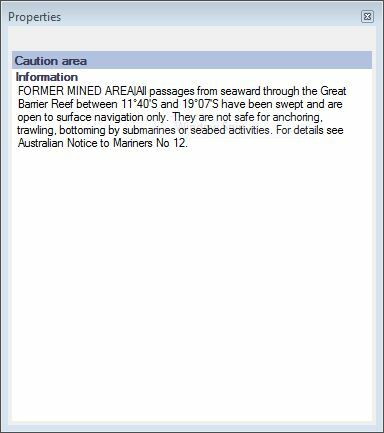 This warning on our chart reads: “FORMER MINED AREA: All passages from seaward through the Great Barrier Reef between 11°40’S and 19°07’S have been swept and are open to surface navigation only. They are not safe for anchoring, trawling, bottoming by submarines or seabed activities.” I wonder how much unexploded ordinance is down there? The entry to McCulloch Reef was a little tricky, but we found a nice anchorage off the inner reef and ran the tender back to dive a large bommie near the entrance. 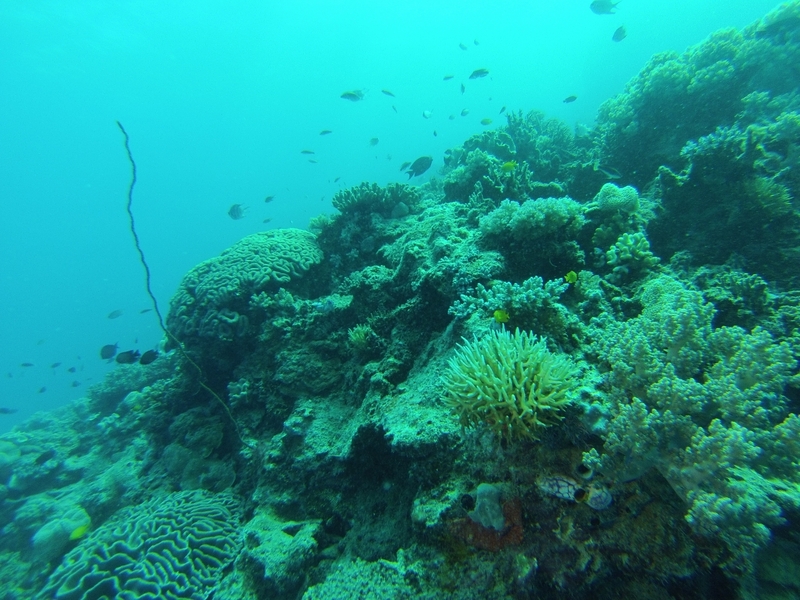 The coral and fish life were decent, with several steep drop-offs. 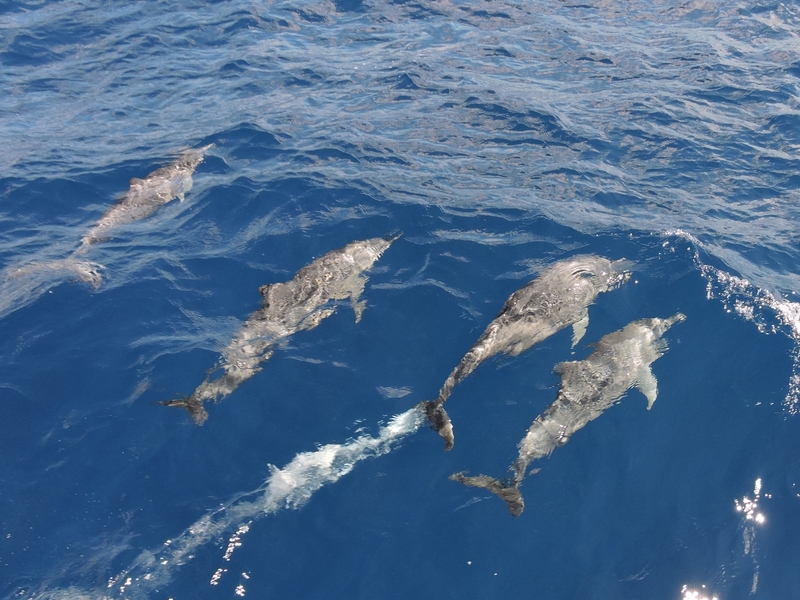 Dolphins chasing our bow as we travel from McCulloch Reef to Flynn Reef. 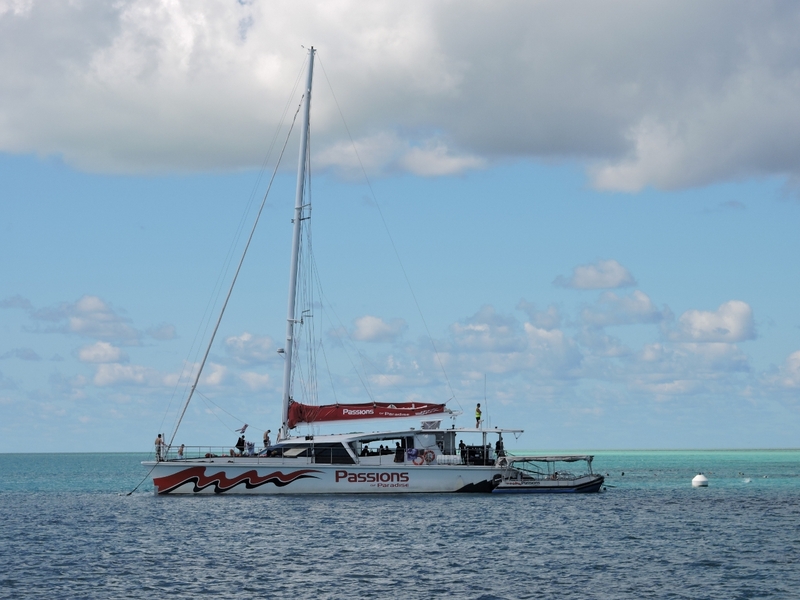 We saw no boats around McCulloch Reef, but now that we’re getting close to Cairns we’re seeing lots of large tourist boats moored off the reefs. 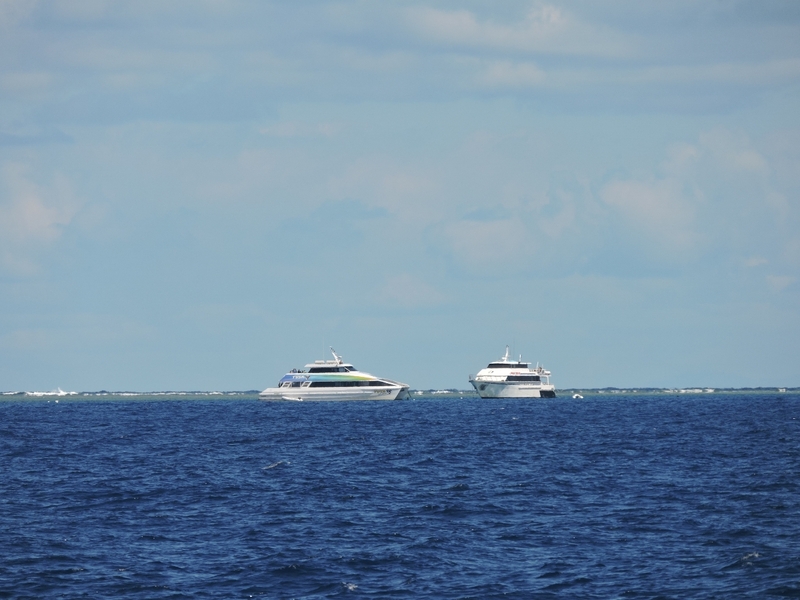 These two are at Milln Reef to our southwest. Tracey’s Bommie at Flynn Reef was a fantastic dive–perhaps the best that we’ve done so far in the Great Barrier Reef area. 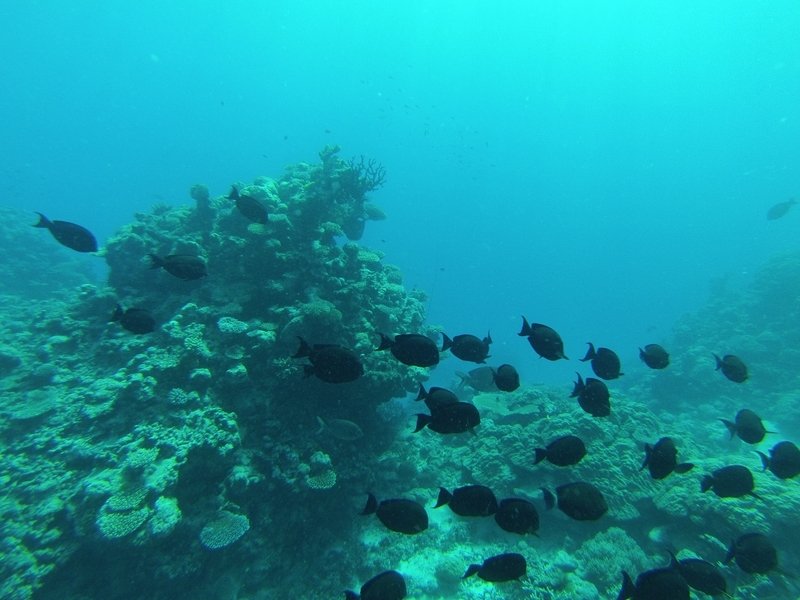 The visibility was excellent and the fish, and particularly the coral life, was incredibly healthy and diverse. In the video https://youtu.be/2DfzRZ5labU (1:38) you also can see one of the giant clams the area is known for. The clam is about three feet long and is about one-minute in, where the camera tilts down. 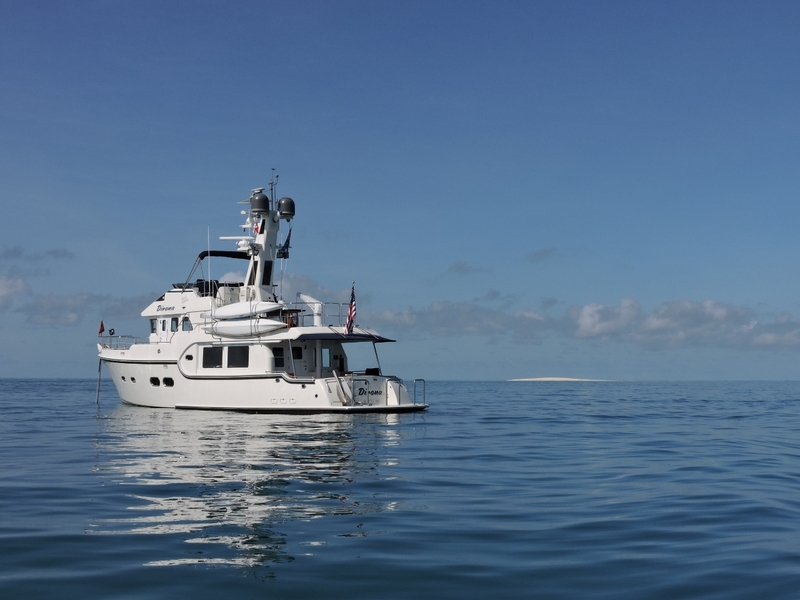 We anchored off Flynn Reef over sand in about 100′ with the flopper-stopper out, as swell protection wasn’t as good as at the last two anchorages. Two other boats overnighted with us: a large commercial dive boat and a sailboat on the one public mooring here. We unfortunately also shared the anchorage with a Booby. who left us this present on the bow. 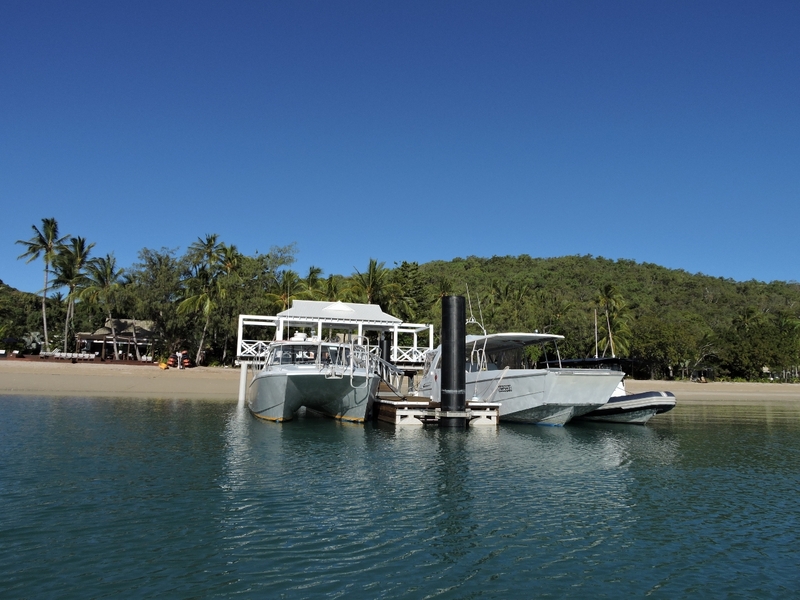 The Great Barrier Reef Marine Park Authority has installed moorings throughout the Great Barrier Reef to allow boats to anchor close to the coral without damaging it. 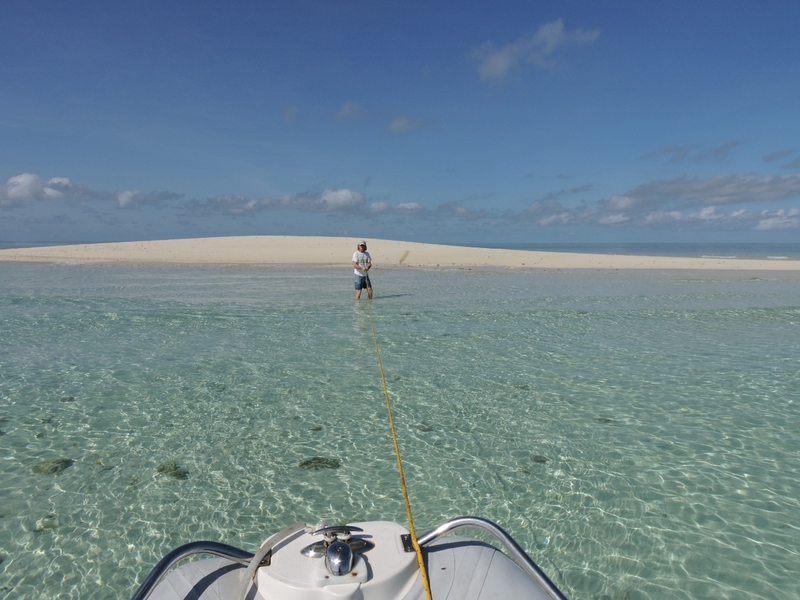 We typically anchor off in deeper water over sand, but decided to pickup a mooring for the first time here at Michaelmas Cay to be closer to the cay and the reef. The moorings are color-coded for the boat size they are designed for. 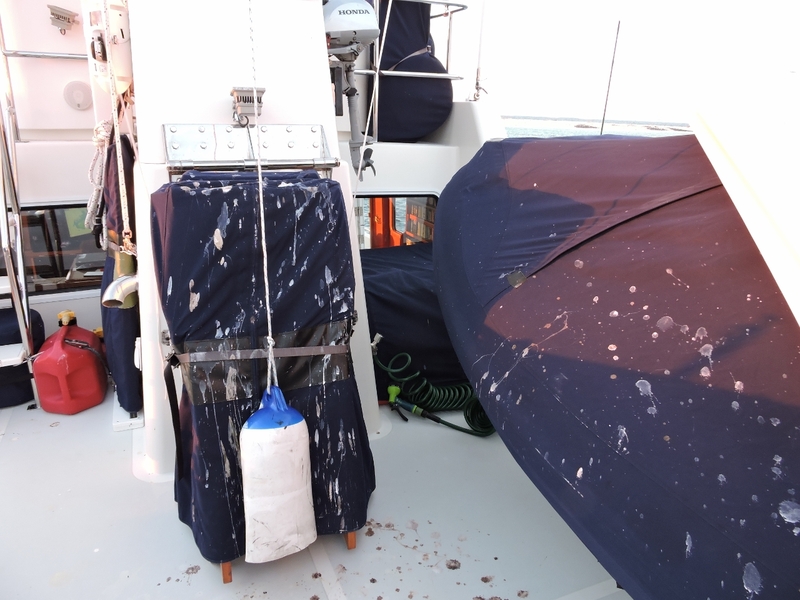 The blue-banded mooring we took can support monohulls up to 25m in a maximum of 35 knots of wind. 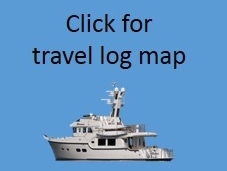 Several private moorings marked an excellent dive site at the Breaking Patches just north of Michaelmas Reef. 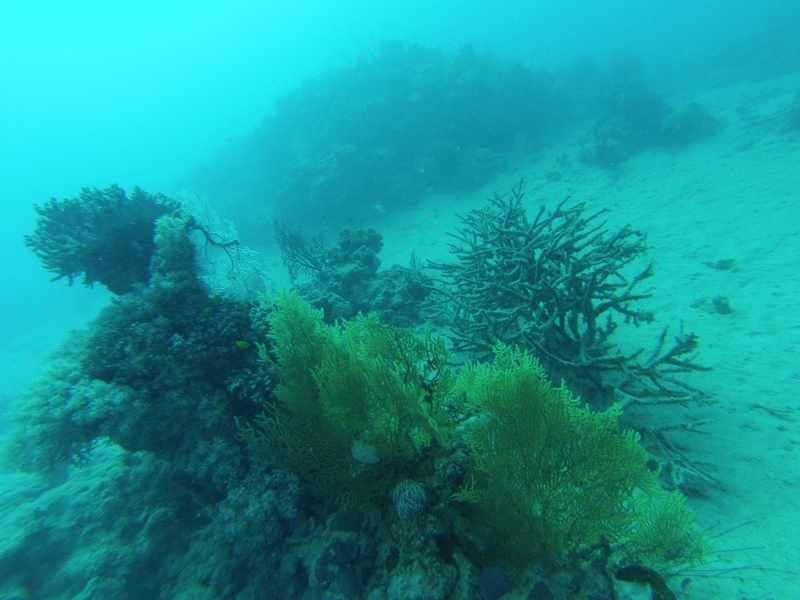 The dive was on par with yesterday’s at Flynn Reef: excellent visibility and diverse, abundant and healthy coral life. The underwater topography was impressive too: the video https://youtu.be/suRdH-Hz9iI (0:22) shows a swim through the narrow channel between two coral-encrusted bommies. 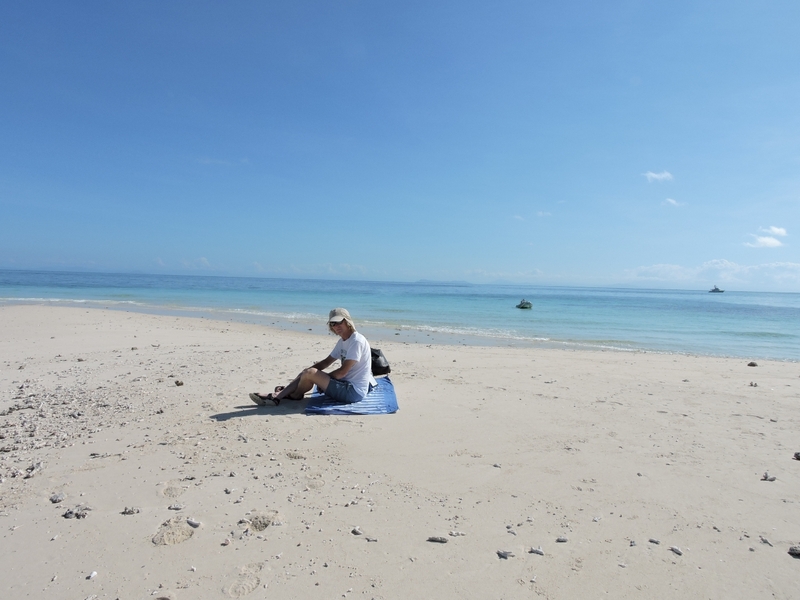 Michaelmas Cay is close to Cairns and a popular day trip. Passions of Paradise is the second large tour boat here since we arrived. We investigated around the several private mooring on the southwest side of the reef for drop-offs or walls, but couldn’t find any so did a second dive near another private mooring on the northwest side. Visibility here wasn’t quite as good as the Breaking Patches dive, but the sea life and underwater formations were equally impressive. The video https://youtu.be/sj4zp4SfbSs (1:15) shows some highlights. Michaelmas Cay is a national park and a seabird conservation area. 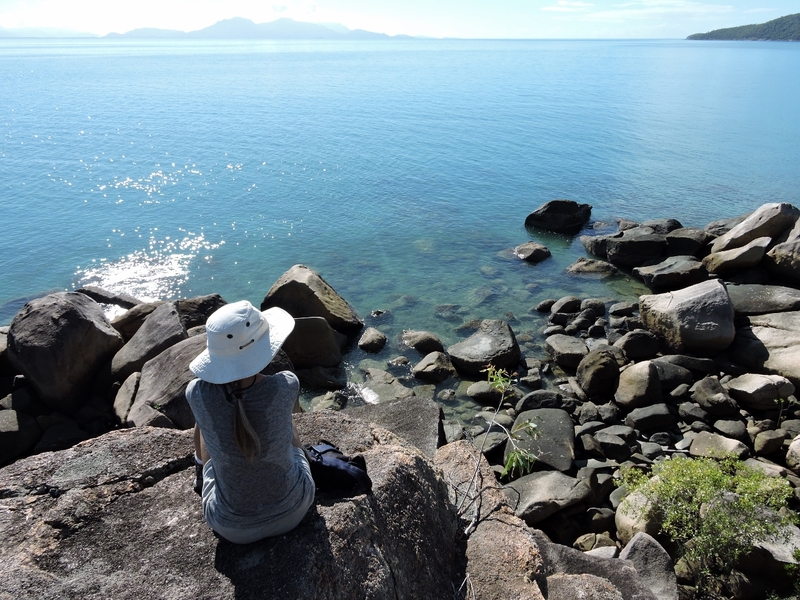 With over 20,000 nesting seabird pairs nesting here year-round, it’s one of the most important seabird breeding grounds in the entire Great Barrier Reef. 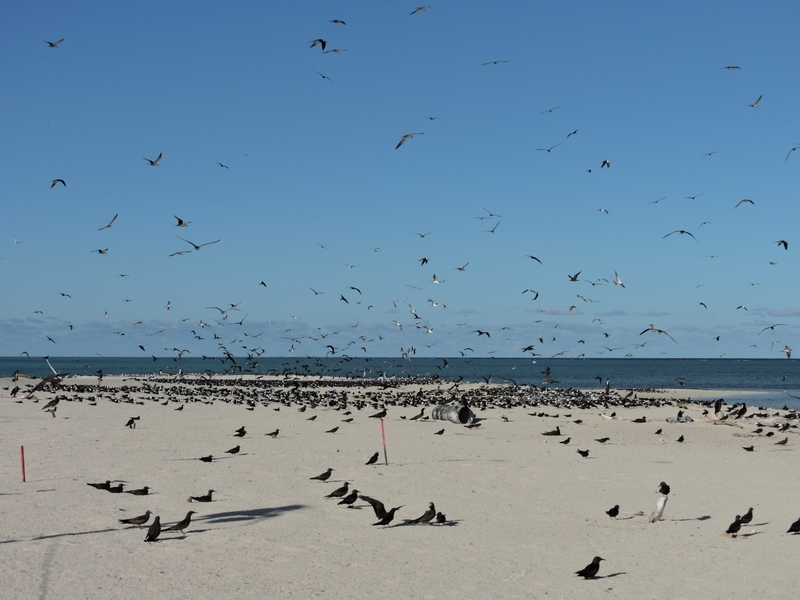 Most of the birds are sooty terns and lesser crested terns who constantly wheel and cry above the cay, as you can see in the video https://youtu.be/gXw8gWcWmi8 (0:25). We were reminded very much of the “Ternados” we’d seen on Palmyra. 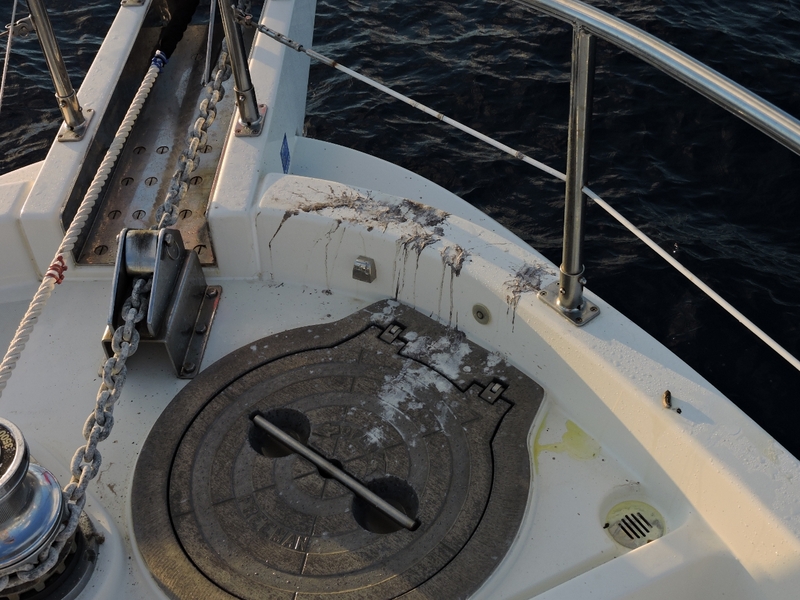 Besides the terns, Michaelmas Cay also has a large booby population who left a large mess on our stack, flybridge and boat deck. Sigh–boobied again.